One topic which generated a lot of discussion at the Gravity and Cosmology meeting was the void model of the Universe. The basic argument is simple: the dark energy is an ugly addition to our cosmological standard model, with 70% of the energy density of the Universe some mysterious substance with weird properties. From a theoretical perspective, dark energy has the wrong density by many, many orders of magnitude, and worse, we may never be able to study it directly in the laboratory. Now suppose I told you I had a model which explained all of the observations, was based on general relativity, and appealed to no mysterious dark energy component (but still has dark matter, unfortunately). Sounds tempting, right? This is precisely what John Moffat, Chris Clarkson, Antonio Enea Romano, Chul-Moon Yoo, and others were advocating at the workshop (Kenji Tomita has also done a lot of work on this; the model has been around for decades). There’s one important caveat, however. The void model throws out the homogeneity and isotropy assumption. The Universe is now spherically symmetric, with a big hole in the middle. Even worse, we happen to be very, very close to the center of the hole. As I discussed in a previous post, John Moffat argues that we shouldn’t be any more disturbed by this model than the standard model, because they’re both anti-Copernican: the void model in space, the standard model in time. As I discuss in that post, I’m not sure I completely agree with this. The fine tuning for the average void model is fairly involved. First, the matter density must be carefully set, as a function of radius, to agree with observation of the luminosity-distance relation. Then we have to be set down within roughly 1 Mpc of the center of the spherical void (which is at least a few Gpc on a side). If we were at a random spot in the Universe, there’s a probability of much less than 1 in 10 billion that we’d end up sufficiently close to the center of a void (assuming such voids existed). On the other hand, the standard Lambda CDM model of cosmology requires fine-tuning of the cosmological constant to a tiny, but non-zero number. To some this is unbearably ugly. But, at the end of the day, it’s just one additional, arbitrary number. All this being said, what’s great about void models is that they aren’t just a philosophical alternative to the standard model. This is physics. There are measurements that can be done to differentiate (and possibly falsify) these models. Stebbins & Caldwell have come up with one particularly interesting approach, exploiting the fact that “random” observers in a void model see a different sky (and hence, a different CMB) from the one we do in our privileged position. It is surprising that a model so radically different from our standard model is still viable (although under pressure). Tests over the next few years are expected to distinguish these models, and we’ll know definitively whether we are at the center of the Universe. WASHINGTON (Reuters) - Melting glaciers, more humid air and eight other key indicators show that global warming is undeniable, scientists said on Wednesday, citing a new comprehensive review of the last decade of climate data. Has project management gone out the window? js_sebastian writes "According to an article on the New York Times, a historical cross-over has occurred because of the declining costs of solar vs. the increasing costs of nuclear energy: solar, hardly the cheapest of renewable technologies, is now cheaper than nuclear, at around 16 cents per kilowatt hour. Furthermore, the NY Times reports that financial markets will not finance the construction of nuclear power plants unless the risk of default (which is historically as high as 50 percent for the nuclear industry) is externalized to someone else through federal loan guarantees or ratepayer funding. The bottom line seems to be that nuclear is simply not competitive, and the push from the US government to subsidize it seems to be forcing the wrong choice on the market." Greetings from one of the best places in the world to learn foreign languages! DLI, CIA University? No, a small town in Vermont that hosts an annual summer language institute: Middlebury. To call the Middlebury language schools a camp is like calling a hurricane a rain shower. At the core of the language program here is the contractual agreement of all participants to only use their language of study for the duration of their stay. The "language pledge" is in effect 24-7 and contributes to the full-immersion environment. In many ways, you are exposed to more of the language than in a country where it is spoken. There is simply no escape from the language outside of withdrawal from the program, resulting in a strange environment in this small Vermont town near the Green Mountain National Forest. 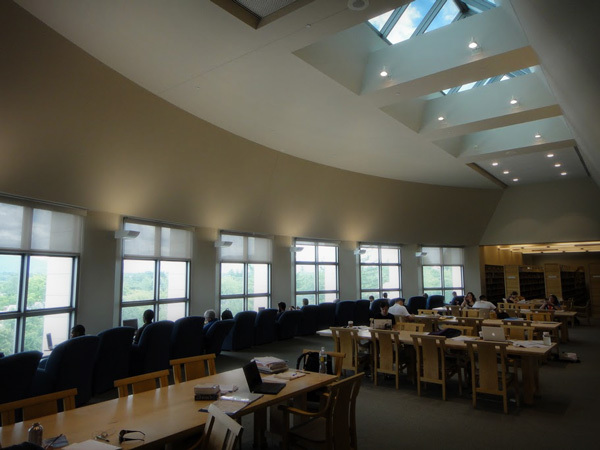 Pictured above is Sunday morning at the library where students pore over word lists, prepare for the upcoming week, and listen to audio files to improve their listening comprehension. Giving up English for 7-10 weeks has a strange, Kafkaesque effect on the brain. You live in a heterotopian space, one that makes you question where and when you exactly are, and how you came to be there. Time seems to stand still in this environment as the new language permeates you, even as an instructor. The frustration of not being able to express yourself in English either gives way to creative uses of the new language, or a bout of 'language breakdown' when students are incapable of any form of communication. This intense committment to staying in the language has resulted in the occasional call from the local hospital asking for a translator for an injured student who is 'stuck' in the language. I am teaching beginning German this summer to students who have had almost no exposure to the German language. They too sign away English for seven weeks, and of course they often make the most progress of all students. It is a testament to the hard work of the students and to the human brain's ability to acquire languages. Middlebury started with a school of German in 1915, when Vassar professor Lilian Strobe thought that Middlebury's isolated geography would make an ideal place to allow students to focus on language learning. Today, Middlebury teaches 10 languages and on any Friday night, the town pub becomes an even more surreal place. As you walk in you can hear a table of German speakers, a table of French, a table of Spanish, etc. If you passed through town accidentally and did not know what was going on, you might question where in the world you were. If you try to speak to the students, you would only get a strange look or an answer in the language they study. The motto of the Language Schools is "No English Spoken Here". Teaching a language without the aid of any English explanations or translations is an interesting challenge, but the challenge forces both me and the students to strain our minds to comprehend and communicate. It forces a more efficient, comprehensive teaching and learning style that manages to promote quick and effective language acquisition. Students from a variety of backgrounds come here, including many graduate students who need a language for their research, government types whose first phrase in the language is "I'm not permitted to tell you what I do for a living," and students who are preparing to move abroad and need to learn as much of a language as possible in a short period of time. The program runs from June-August only and is roughly the equivalent of two years of instruction. The real trick is the constant immersion and steady interaction with other speakers. Contrary to popular belief, there is no way to 'pick up' a language quickly with self-study. Languages are spoken among people and that spoken interaction is critical to learning. Here, students only sit in classes 3-4 hours daily. The rest of the day is spent doing other activities involving high frequency vocabulary such as working out, playing teams sports, yoga, singing in a choir, eating, drinking, putting on a play, playing billiards, and hiking in the nearby forests; all in the target language. Often, these seemingly superfluous interactions outside of the classroom prove to be the most beneficial way to solidify what one has learned in the classroom earlier that morning. I have long lamented the state of language education in the United States, but I see change and improvement in foreign language education every year. Middlebury reflects this trend and has shown a steady increase in demand. Overall applications for admission to the program have increased 120% over a ten-year period. For Arabic, applications are up 375% and this increase has prompted the program to move the Arabic school to Mills College in Oakland, California. For my passion, German, applications are up a significant 75% with steady enrollments over a ten- year period, countering the trends of decreasing interest after the fall of the Berlin wall. For a realistic look at the amount of progress made, you can view the before and after videos on the Middlebury web site.